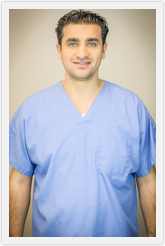 Dr. Tawfiq Nadi received his DDS from Columbia University, College of Dental Medicine. In July of 2005 he received his Bachelor of Dental Surgery from the University of Egypt. He is fluent in both English and Arabic, and has completed seven years of study at English speaking institutions. Dr. Nadi is a member of the American Dental Association (ADA), Wisconsin Dental Association (WDA), Greater Milwaukee Dental Association, and The Leading Physicians of the World Association. He is CPR certified and eligible to administer Nitrous Oxide. In his spare time, Dr. Tawfiq Nadi enjoys playing basketball, singing and traveling the world. He has the ability to work effectively with diverse at-risk populations, and he is interested in reading and searching the web for the latest dental techonolgies and information. He spends hours on his work and is dedicated to being the best dental practitioner in West Allis, Wisconsin.